MDT package now on Chocolatey.org ready for Windows 10! Been a while since I posted, I’ve been busy with Surface, Windows 10, and other Kits. But my chocolatey package just got approved, so I thought I would share. I’ve been following the progress of PowerShell’s OneGet, and http://Chocolatey.org for a while now, and thought it was time to stick my toes in and create a package for public use. MDT seemed like a great start. As you may already know OneGet is a new feature of PowerShell, included in Windows 10 and available through WMF 5.0 that allows for the installation of packages over the internet. Chocolatey is one of the back-end providers, with a great collection of apps ready for installation. With the recent release of MDT 2013 Update 2, it seemed like a great opportunity to practice my packaging skills. Eventually I created a PowerShell script to auto generate the chocolatey package (not shown here), it would download the MSI files, and extract out the MSI Product Code and Checksum values. You can see the code generated on the Chocolatey MDT page. Chocolatey has some PowerShell scripts that run in the background, so we need to allow PowerShell to run these commands with the Set-ExecutionPolicy command. Most Powershell users run this command anyways, so it’s not that uncommon. We must specify the “-ProviderName Chocolatey” parameter the fist time we call Install-Package so the chocolatey Provider is installed, MDT is only known to Chocolatey at this time. Install-Package will prompt us to confirm installation of the chocolatey provider, we can skip this with the -ForceBootStrap parameter. Additionally, Install-Package will also ask for confirmation before installing MDT, and we can sip the confirmation with the -Force Paramater. We can see Install-Package downloading MicrosoftDeploymentToolkit2013_x64.msi from the Microsoft web servers. The Windows 10 ADK package has also been uploaded to Chocolatey, but hasn’t been officially approved yet, so when you try to run the “windows-ADK” package it will install the older Windows 8.1 version. We can force the Windows 10 ADK to install with a version parameter. Additionally, the default version of the “Windows-ADK” package does not install USMT, so to install everything we will need the “windows-adk-all” package (which is a lot of stuff, sorry). (Haven’t posted in a while, been busy with my day job(s), travel, scripting, sleep :^). Some of you have recently noticed that MDT 2013 Update 1 has changed the way it sets the permissions on the network shares when it creates them for the first time. 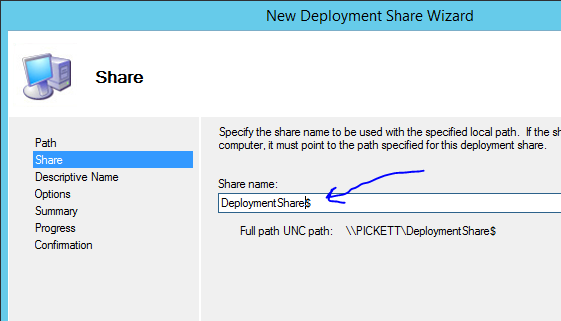 When you create a new deployment share in MDT, it will ask you what the network share should be, and the wizard will automatically create the necessary bindings for the share and your local path, including setting up the permissions. Super! The old permissions used to be “Everyone” has full access, it’s now set to “CREATOR OWNER”. I was somewhat confused by this change, and seemed a bit arbitrary to me. I suspect that someone filed a bug against MDT thinking that locking down the deployment share in the most restrictive way possible would somehow be better, because you know… Security! Think of the security breaches at Home Depot, and Target. PKI. Oh the humanity. Well, MDT deployment shares don’t really store sensitive information, if you *DO* store any sensitive information on a MDT deployment share, then you are doing it wrong. But anyways, someone made the decision to lock down the share, although “CREATOR OWNER”, this is kind of confusing to me, only one user? Why not use local “Administrators” group, local administrators already have full access to the files. “CREATOR OWNER” might only give access to one of several local “Administrators”. Anyways, this new permissions change for MDT 2013 Update 1 hasn’t caused much of a problem, as most users can easily work around the issue by adding extra approved users to the share afterwards. Got a question today about a missing DeployRoot varaiable in BootStrap.ini. MDT uses BootStrap.ini in WinPE to remember where to find the DeploymentShare to do the heavy lifting. Normally, when creating a new DeploymentShare, MDT will automatically update the DeployRoot variable in BootStrap.ini, however several users were observing that this was no longer getting updated. You can see here that MDT is attempting to open the Bootstrap.ini file and write the Path to the DeployRoot Value. Note that MDT is trying to load the Bootstrap.ini file using the same “UNCPath”? I suspected that MDT was failing to open the file due to the restrictive “Creator Owner” permissions, Sure enough, I tried opening the file over the network and it failed. Found! Did you know that you can download *.iso images of Windows 10 using the Get Windows 10 app? It’s a tool that will allow you to download *.iso images for deployment. The only problem is that it doesn’t actually download *.iso images, instead, it downloads *.esd images, which are highly compressed *.wim files, that are encrypted/encoded. The tool then decrypts/decodes the *.esd file into *.wim files, and constructs a *.iso image for use. Additionally, the *.wim file is still a highly compressed *.esd file, so legacy tools that leverage the WIMGAPI library like imagex.exe don’t understand it. Dism works fine. That means that you can’t import the images into MDT, because MDT uses the WIMGAPI libarary, and powershell commands might not work either. I tried to export the *.wim file to another *.wim file, but DISM.exe doesn’t like doing that either. As a work around you might be able to export the *.wim file to a *.vhd container, and re-capture back to *.wim file with normal compression. Johan has been documenting esd to wim techniques on his blog. Got an interesting question yesterday about the Symantec Management Agent (SMA). Someone asked about running sysprep.exe under the system context, and someone else mentioned that execution of the sysprep.exe is *not* supported in the system context for Windows 10. I suspect this has to do with all the new fancy Metro/Modern/Universal apps that have plenty of junk that needs to be cleaned up by sysprep. What is the System Context? Well normally when you run a program in Windows, you are running it under your user context. 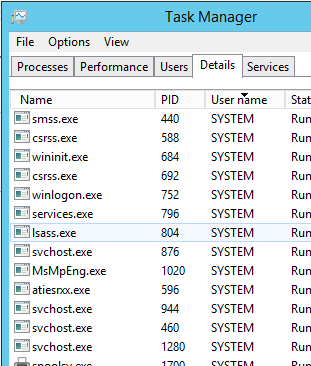 However If you go to the Task Manager, “Details” tab, you can see that there are dozens of background processes running, some with the user name “SYSTEM” these are specially designed *.exe programs that run in the background and perform numerous tasks. There is no problem for MDT LiteTouch build and capture task sequences, however if you were to use SCCM to build and capture, now you may have a supportability problem, because SCCM runs tasks sequences in the system context. Whoops! I have filed a bug on connect asking for a Supportability statement from Microsoft. Got a IM today from a Consultant who was having trouble creating an end to end deployment of Windows 10 for some Surface Pro 3 devices. Hey, I love Surface Pro 3 devices ( I have 3 in my office :^), so I thought I would help out. The error message was when he tried to enable BitLocker, but that turned out to be a red-herring. What does WinRE have to do with bitlocker? OK, we ran REAgentC.exe /Info to see what the status of Recovery was, and turns out that it was *NOT* installed. BitLocker wont’ start because it’s missing WinRE, and WinRE won’t install because of BitLocker. Super!! Well after digging some more, we found out from the panther logs that the REAgentC.exe command was attempting to copy the WinRE.wim file from the OS partition to the WinRE partition created by MDT’s ZTIDiskPart.wsf but failed because the size was too small. Too small? Wow, the Windows 10 x64 WinRE image is *far* bigger than the other versions. Well, since the Surface Pro 3 will *only* use x64, we better account for at least 310MB on our Recovery Partition. Our 302MB image is just *not* going to fit on a 300MB partition. Nope. in ZTIDiskPArt.wsf to something like 400?